Imagine this: A soft serve ice cream machine that not only dispenses soft serve ice cream, but also dishes out soft serve that’s been mixed with Nutella! Soft serve ice cream mixed with Nutella – sound too good to be true? Well, it is no joke… but it’s only going to be available for another couple of weeks. Carvel, which is a popular soft serve ice cream franchise that operates in many locations throughout the United States, recently partnered with Nutella, the manufacturer of “a tasty, unique spread made from the combination of roasted hazelnuts, skim milk and a hint of cocoa” and launched a delicious soft serve flavor combination available for a very limited time. The two companies are working together on a summertime promotion that began on June 30, 2014 and will last until September 30, 2014. Therefore, there are only a couple of weeks left for fans of Carvel’s soft serve machines and Nutella to experience several one-of-a-kind frozen treats. Americans have been enjoying the treats served in Carvel’s soft serve machines for many decades. According to a press release published on Carvel’s website, the company is celebrating its 80th anniversary this year. Similarly, Nutella is celebrating its 50th anniversary in 2014. These milestone anniversaries are a great reason to introduce a special limited-time flavor! Loyal enthusiasts of Carvel’s soft serve ice cream machines who have been enjoying the delicious Carvel-Nutella combination since the beginning of June are surely going to be disappointed when the soft serve machines dispense their last Nutella ice cream treats at the end of September. 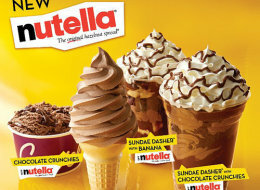 If you are lucky enough to have tried a soft serve ice cream-Nutella treat this past summer, we want to hear from you. Was it as good as it looked? Many times, a soft serve ice cream machine promotion, such as the one implemented by Carvel and Nutella, is enough to draw many new and returning customers into an ice cream shop. These flavors, both currently available in the soft serve ice cream machines at respective and participating Carvel and Dairy Queen locations, both sound too good to be true!